Ingredients: Noomi Rapace, Michael Fassbender, Guy Pearce, Charlize Theron, Logan Marshall-Green, Idris Elba, Rafe Spall, Sean Harris, Kate Dickie, Emun Elliott and Benedict Wong. Directed by Ridley Scott. Run time: 124 minutes. Rated: R.
At First Bite: The trailer looked pretty cool, but I can't say I was anxiously anticipating the film's release. However, my co-worker Jared was totally psyched to see it. So, we checked out the opening midnight show. It's 2089. A couple of archaeologists, Shaw (Rapace) and Holloway (Marshall-Green), have discovered a map in cave drawings from around the world. They believe it's an invitation from our creators. Four years later, Weyland Corporation sends a crew of top scientists, along with an android named David (Fassbender), aboard the spaceship Prometheus to find answers to the origin of mankind. Of course, things don't go quite as planned. Tough to Swallow: David tells Vickers the crew has been in hyper sleep for 2 years, 4 months, 18 days, 36 hours and 15 minutes. 36 hours? How many hours are in a day in the year 2093? In Shaw's dreams, she is a child speaking to her father, but we see the child. Most of my dreams are from my point-of-view. Pretty sure David would have had to learn more than symbols to be able to SPEAK the alien language. You'd think top scientists wouldn't want to contaminate an alien planet. Seems like there is no protocol at all in this movie. The decapitated Engineer's head wouldn't gurgle without lungs. 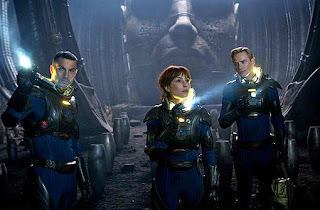 Something to Chew On: PROMETHEUS is a spin-off of ALIEN, not a prequel. Although, it comes really close to being a prequel. The film was originally titled PARADISE (December 2010). Carey Mulligan, Natalie Portman, Anne Hathaway and Olivia Wilde were a few actresses considered for the role of Shaw. James Franco was considered for the role of Holloway. Michelle Yeoh was considered for the role of Vickers. Patrick Wilson appears in a dream as Shaw's father. Ian Whyte, who plays the Last Engineer, has also been cast as predators in the ALIEN VS. PREDATOR series. The Weyland logo appears as part of David's fingerprint. At the end of the credits, a logo appears and reads "Brought to you by Weyland Corporation - Building better worlds. Since 10/11/12." Aftertaste: I've seen all the ALIEN films, but I'm not a fan boy when it comes to the series, which is probably why Jared was more disappointed in the movie than I was. To me, the best part of PROMETHEUS is its look. I wouldn't be surprised to see an Oscar nomination/win for Best Art Direction. Fassbender and Rapace are the two bright spots in the cast. Fassbender's David is the most intriguing character, by far. He's an android with a thirst for knowledge, a love of LAWRENCE OF ARABIA and a super-creepy vibe. The creepiness comes into play because he seems to be programmed to be curious and mischievous for no reason. Shaw has the best scene of the movie. I won't ruin it for you, but it involves the med pod. So, that's three things the movie has going for it. I'll make it four by adding the connection to Greek mythology. I love me some Greek mythology. Prometheus is known for creating humans from clay and stealing fire from the gods. He gave the fire to humans and was punished by the gods for it. Okay. I think the Engineers represent Prometheus, the black goo is the fire and the xenomorphs are the gods. The recordings of the Engineers running to escape something seem to suggest a form of punishment, perhaps, but for what? Giving the black goo to humans? That is yet to be seen. The science parts are just too laughable to take seriously. I spent most of the 124 minutes shaking my head. People are complaining that the film leaves too many questions unanswered. Eh. Whatever. There will be a sequel, I'm sure. Luckily, I don't have to worry about as many crappy scientists next time around. Despite the numerous holes in logic, PROMETHEUS is visually stunning.